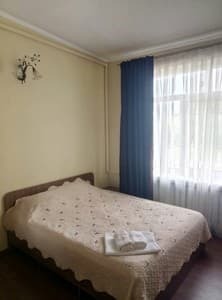 Mini hotel Dolce Vita is located in the central part of the village Beregomet Vizhnitskogo area, 500 meters from the foot of the Stichok mountain. The hotel is located on the second floor of the hotel and restaurant complex "Pearl of the Carpathians". 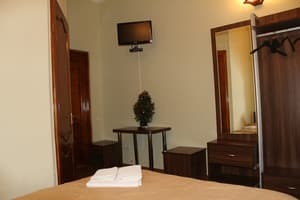 To the service of tourists are offered 7 cozy rooms, equipped with comfortable furniture, individual bathrooms, satellite TV, Free Wi-Fi. On the territory of the hotel Dolce Vita there is free parking, car wash, an open veranda (in the warm season), a banquet hall, a pizzeria, a grill. 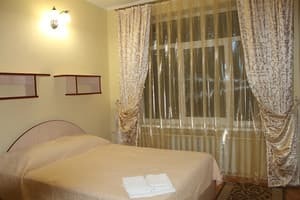 At a distance of 200 meters from the mini hotel is the tourist and entertainment complex "Stizhok" with an operating restaurant, a banquet hall, a night club, a disco, a gym, open-air pavilions. For guests it is possible to call a taxi and order a transfer from Vizhnitsa or Chernivtsi. In 100 meters from the hotel there is a bus stop, in 15 minutes walking - a grocery store. The distance to the GC "Migovo" - 13.6 km, Vizhnitsa - 22 km, Chernivtsi - 57 km. Description of the room: The room is made in light colors, has a family bed with orthopedic mattress, work area. 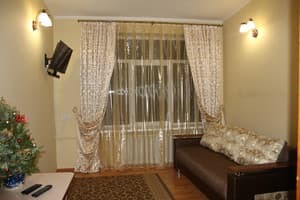 Description of the room: A spacious one-room apartment with a view of the village and territory of the National Nature Park Vizhnitsky. The room has a large double bed and an extra fold-out bed. Description of the room: The room consists of two rooms separated by an interior door. The sleeping area is equipped with a dressing room (shelves, a hanger, a place for storing luggage), a double bed. The living area is a separate room with a pull-out bed, a dining table, a set of chairs, a TV. It is possible to provide one extra bed (for an additional payment) for an adult or a child. Хозяин отличный, шустро отвечает. Номера чистые. 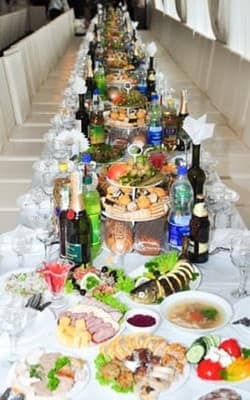 В кафе (внизу) вкусно кормят и девушки оч вежливы. Шумно по непонятным причинам. До 23.00 работает бар. Если номер выходит на сторону гор, учитывайте это. Понравилось абсолютно всё. Чисто, спокойно, уютно. Действительно, ОТДЫХ с большой буквы. Обязательно вернёмся в этот же отель! Берегомет богат историческими памятниками и потрясающими пейзажами. Children under 4 years with two adults without a separate bed are accommodated for free. Children over 4 years with a separate bed will pay the full cost of accommodation on the main bed. Accommodation of an adult on an extra bed in the rooms of the category "Family" is paid additionally. On the territory of the complex from 11:00 to 23:00 there is a pizzeria with 30 seats. In the spring and autumn season there is a summer terrace. The banquet hall for 150 seats with live music is open for celebrations. Hotel Dolce Vita is located in the center of the village of Beregomet. The distance to the GC "Migovo" - 13.6 km, Vizhnitsa - 22 km, Chernivtsi - 57 km. On the route "Chernivtsi-Beregomet-Chernivtsi" the public and route transport is constantly running. Transfer is possible (approximate cost from 35 UAH).